On our way home from Paraguay I wanted to stop for a day in Panama to see the canal, a side benefit is we didn’t have to do the long trip home all in one stretch. We arrived in Panama at 6:30am and headed to the hotel, thankfully they had a room they could give us right away and allowed us to do an early check in. We were in time for the free breakfast that was included and they only charged us half a day. What a blessing! We ate, showered, rested a bit and then on to a tour I booked for the afternoon. The tour took us to the canal first and we got a history lesson from a very knowledgeable lady who went to school for 5 years to become a tour guide! She can do it all, jungle tours, city tours, boat tours, history tours, and canal tours with all the facts and every question answered. We learned a lot, saw a lot and thoroughly enjoyed ourselves. The canal was first started by the French, but after 8 years and too many deaths (20,000 from malaria & yellow fever alone) and running out of money, they called it quits. In stepped the U.S. to figure out what was causing the sickness (thinking it was ant bites, they had put standing water all around the houses and the camps). A doctor from Cuba and one from the U.S. went to investigate. When they realized it was the mosquito they fumigated and drastically reduced the amount of deaths. 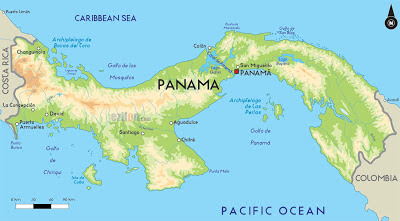 At that time Panama was part of Colombia. The U.S. offered Colombia a deal which they rejected and so 7 men from Panama approached the U.S. saying they would do the deal with them if they helped them get their independence from Colombia. The deal was made and construction began the following year (1904) and was finished in 1914. We watched a ship go through the Miraflores Lock – one of three locks on the Pacific side that raises the ship up to the level of the man-made lake and then locks lower it down again on the Atlantic side. It is 50 miles from the Pacific to the Caribbean (Atlantic) and takes approximately 8 hours as opposed to 16 days to travel down around the tip of South America. 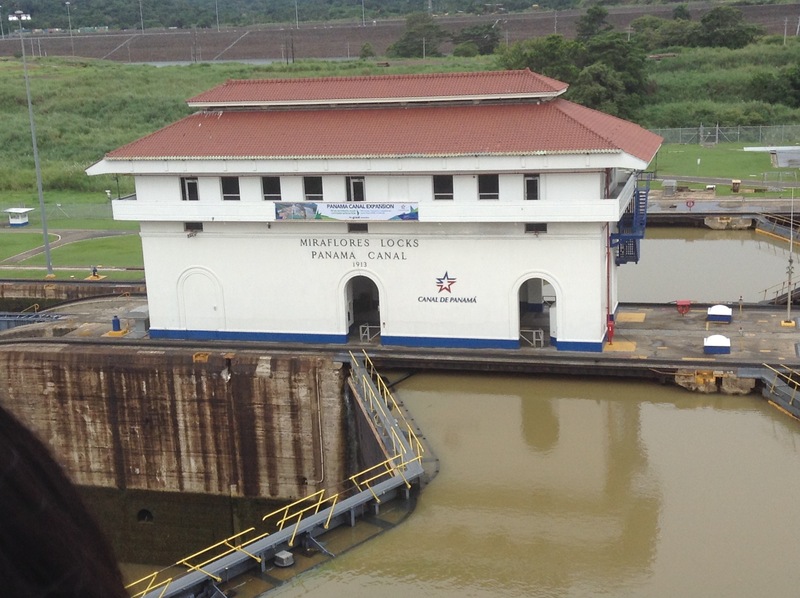 The canal was owned and operated by the U.S. but was given back to Panama in the year 2000. This is when tourism began to take off as well as the construction of hundreds of high rises and the number of banks rose from five to over a hundred. In June of this year (2016) a new canal was built parallel to the existing one accommodating bigger vessels and allowing more ships to cross per day. It also recycles 60% of the water which is a big improvement over the 52 million gallons of fresh water used with each ship in the old canal and ending up in the ocean. Only one bridge goes over the waterway that cuts the country into two parts, East and West, but it isn’t the canal that prevents one from driving from Alaska to Chile. The Darién Gap, a 200 mile stretch of jungle inside the Darien National Park separates Panama from Colombia. No road or railway goes through this jungle that is sparsely populated by a few indigenous tribes, poachers, gorillas or paramilitary. It is not to Panama’s advantage to make a highway on through to Colombia and allowing easy access to that country. So it stays a virgin forest buffer between the two countries. The old city has a large beautiful church and square, then only a few blocks around the square there used to be a wall, some portions still remain today. 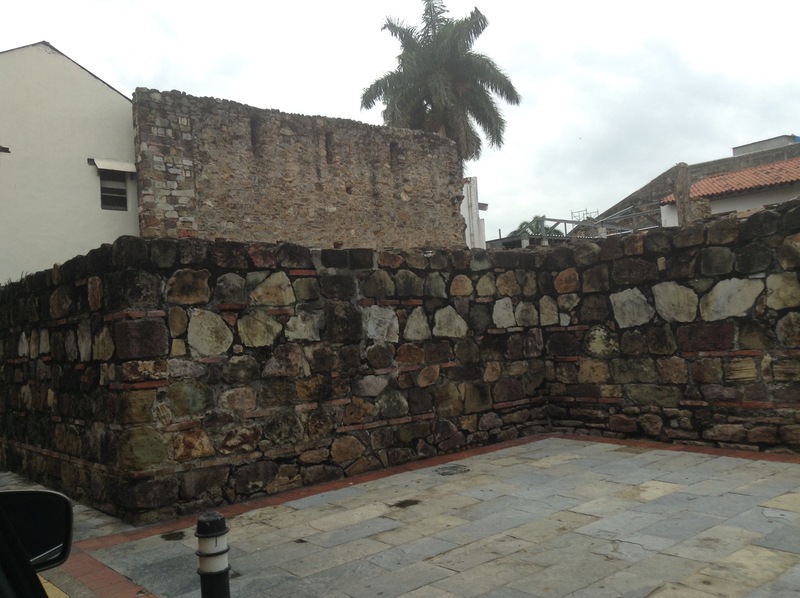 The wealthy Spanish lived inside the wall and on the other side of the wall is where the workers lived. Over time the wealthy moved out of the small inner city to other areas created for them that were more modern and had more space. The people who lived outside the wall now moved in to the abandoned homes in the inner city. These beautiful buildings were not maintained and fell into disrepair. Today they are restoring these charming old buildings and using them as hotels, residences, and businesses . It is quite a contrast to see these buildings and only a couple blocks away rundown crowded apartment buildings. We also visited four islands that have been connected to the mainland by a causeway created with all the dirt that was taken out to build the canal. 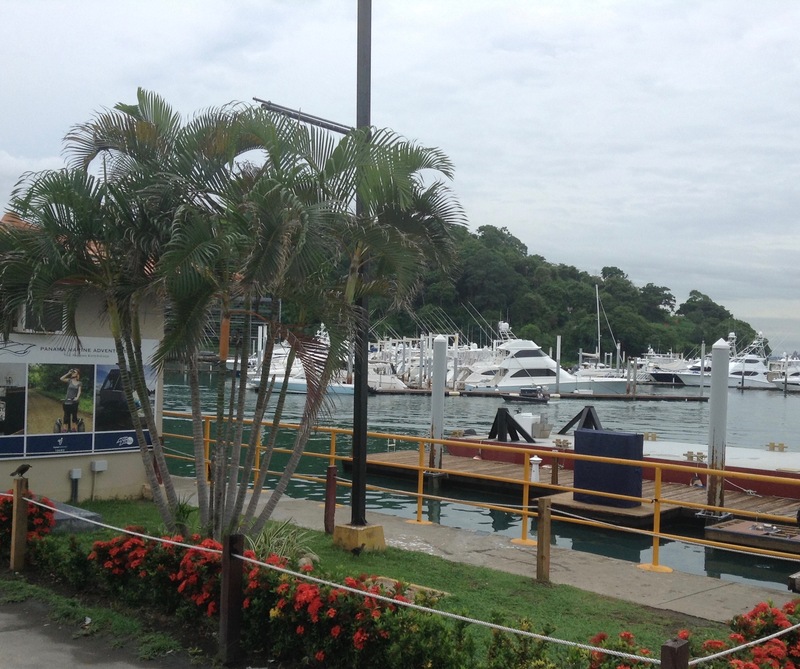 Beautiful boats dock all around these islands, with a few restaurants, gifts shops and small hotels. 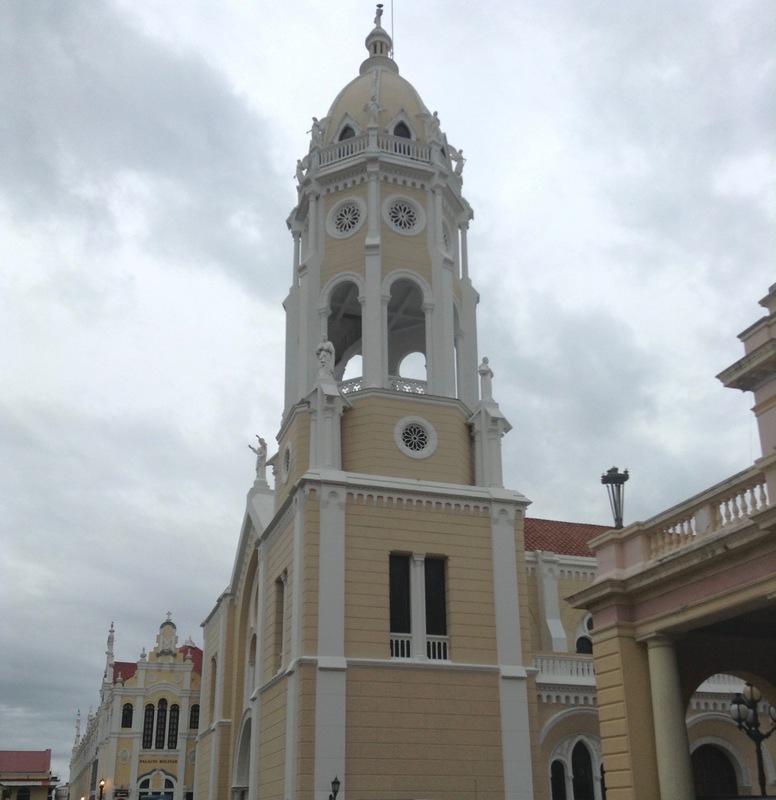 Panama is a mix of many peoples and cultures. First of all the Spanish came and intermingled with the Indigenous people. Then the French came to build the canal and brought people from the West Indies. Then the U.S. came to finish the canal (operating it for 100 years). 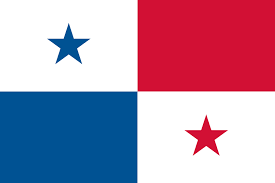 The people of Panama are a mix of them all. What a city of contrasts! From the people to the landscape of ocean, jungle and skyscrapers. There is the old inner city and the old outer city, and there is the new city with its skyscrapers, night clubs, banks and shopping malls. The rich and the poor. 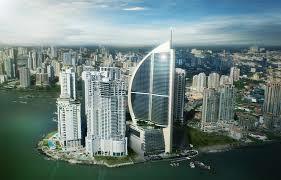 Panama is different from any other Latin American country that we have been in. The canal brings in a lot of money, so the minimum wage is higher here. There is access to medical and education and opportunity. We ate at the Trump Tower, the tallest building in the city – 66 stories – what a view! We also used Uber for the first time – the largest taxi company in the world, and they don’t even own one taxi. 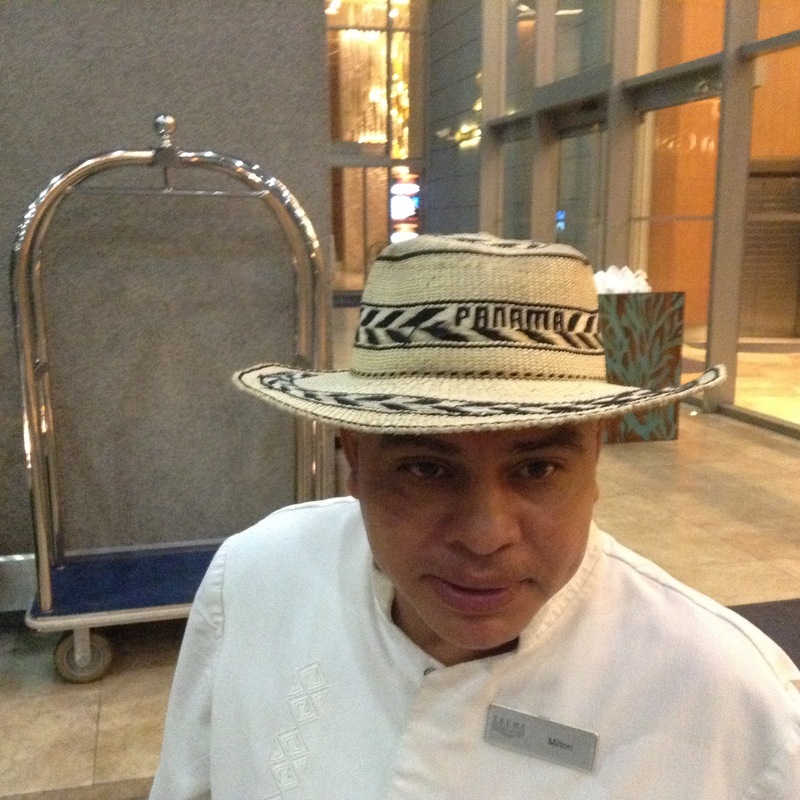 The famous Panama hat is not originally from Panama! The story goes that President Roosevelt was visiting Panama to see the construction site of the canal, and it was hot. Someone gave him a hat that he took it back to the U.S. with him and it became known as the Panama hat, but it was actually from Ecuador. This is the authentic hat that they make in Panama. Would loved to have stayed a few more days to explore the beaches and jungle, spot some exotic birds to add to my life list and learn a bit more about the culture and food! But all good things have to come to an end and it is good to be home.